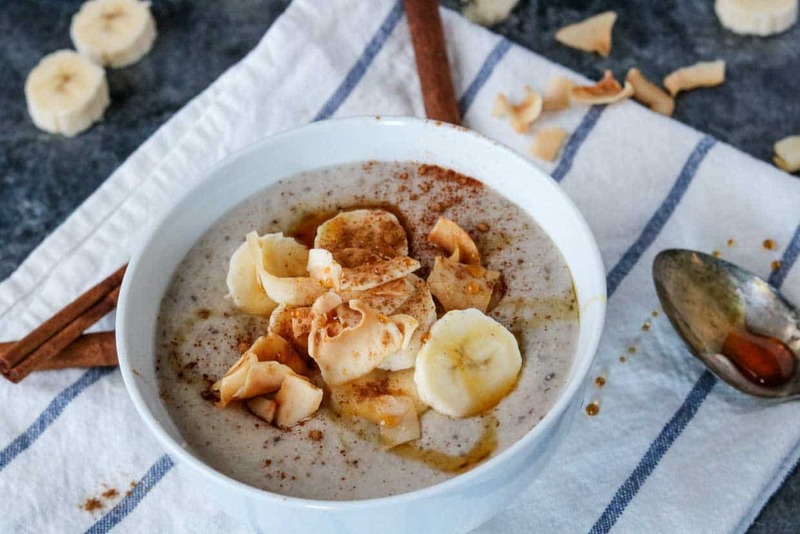 This gluten-free banana n’oatmeal is the perfect comfort food, especially for recovering from the stomach flu that hit our house this past weekend. What’s n’oatmeal? 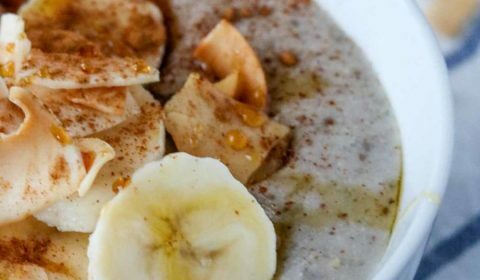 Well, it’s an alternative to traditional oatmeal that removes the oats and instead replaces them with flax seed, chia seeds, and other non-grain options. Flaxseed is not only full of fiber but also contains omega-3 fatty acids. Chia seeds are also very rich in omega-3 fatty acids, even more so than flaxseed. So you’re getting a good dose of healthy, omega-3 fatty acids, plus fiber, with this n’oatmeal. 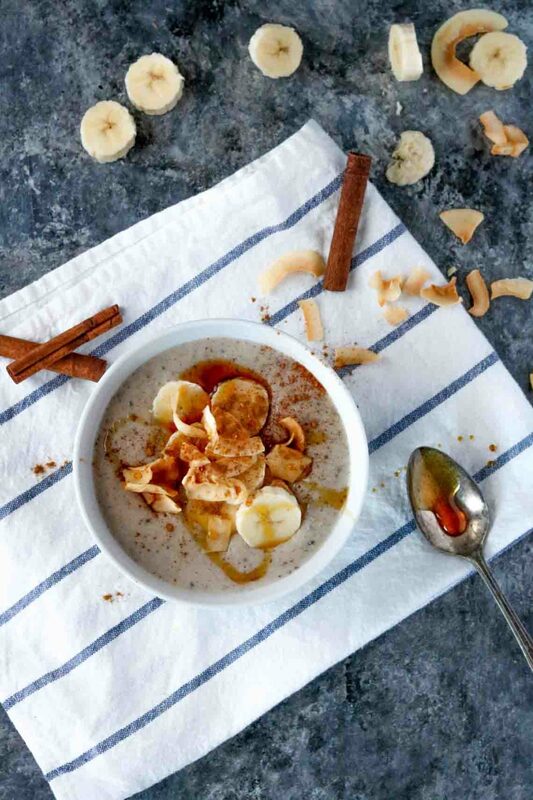 On top of being super healthy, this gluten-free banana n’oatmeal is full of flavor. It’s not plain and pasty like traditional oatmeal. 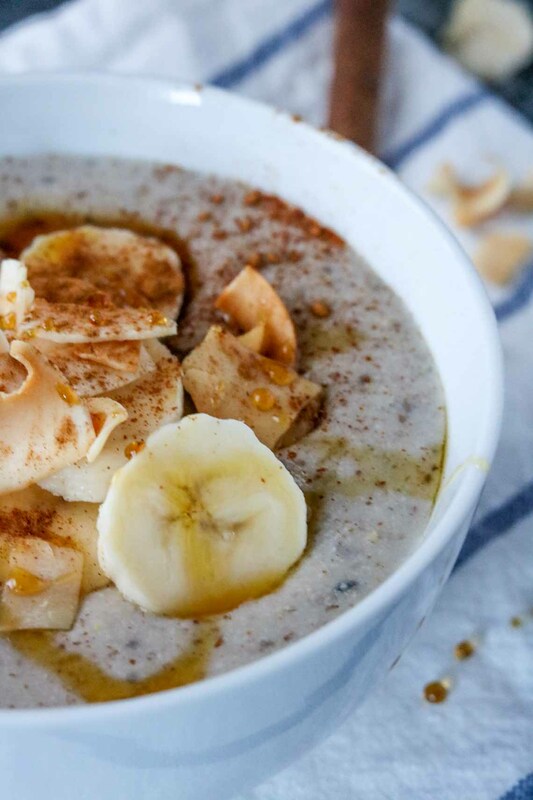 The bananas gives it a hint of sweetness, it’s almost like eating a pudding for breakfast. One batch of this recipe will also serve you for several days and it stores well in the refrigerator for the week so you’ll be set in the morning! Just re-heat and enjoy. I also drizzled raw honey on top, plus a little cinnamon and unsweetened toasted coconut chips. Add the bananas to a food processor and blend. Transfer blended bananas to a medium saucepan and add the remaining ingredients, except the honey and coconut chips, to the saucepan. Whisk together and heat on medium-high for 5-10 minutes. If the mixture begins to slow boil, reduce heat down to medium. Whisk continually. Remove from heat and transfer to a bowl. Top with additional sliced bananas, raw honey and coconut chips.